That was fast. Ashton Kutcher is set to play Steve Jobs in an independent film titled ‘Jobs’. Joshua Michael Stern will direct from a screenplay by Matt Whiteley according to Variety. Stern is mostly known for directing the Kevin Costner vehicle ‘Swing Vote’ while I can’t find anything Whiteley has done. This might be his first big project. 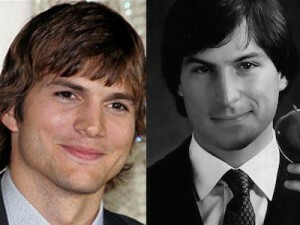 The film will follow Steve Jobs from his younger days to him being the co-founder of Apple. The film will start shooting early this summer while Kutcher is on break from ‘Two and Half Men’. I won’t be surprised to see a few other Steve Jobs films and documentaries coming out this year or next. I believe Sony Pictures already has one in development as well. Kutcher is by no means my first choice, but I’ve seen in his past films that he has a bit of acting chops in him. I just hopes he pulls this off. There are tons of Apple fanatics out there who are going to be putting this under a microscope, so Kutcher better be ready. But I hope I’m wrong in thinking this was a poor casting decision. This entry was posted on Monday, April 2nd, 2012 at 6:24 pm	and is filed under Film, News. You can follow any responses to this entry through the RSS 2.0 feed. You can skip to the end and leave a response. Pinging is currently not allowed. « Jim Carrey and Jeff Daniels Are Back for ‘Dumb and Dumber 2’!! !